Before "The Beach", the first backpackers arrived on Phi Phi Island from Phuket, Krabi and Samui in the middle 1980s. The main pull to the island still is the scenery and diving. A few dive schools opened up and greater numbers of travelers came. Those first back packers could stay on the island when the Phi Phi Cabana Group built it's first few rough bungalows in the 1980's. At this time it was well water and radio phones. Boats to the island were the traditional longtail boat which could take up to 4 hours. The village people were the original settlers from Koh Yao arriving after WW2. They were untouched by commercial tourism and lived a Muslim life similar to the way their fore fathers had done. When the wave of bungalows were built in the late 1980ï¿½s and early 1990ï¿½s it awakened the local inhabitants to the tourist business potential. 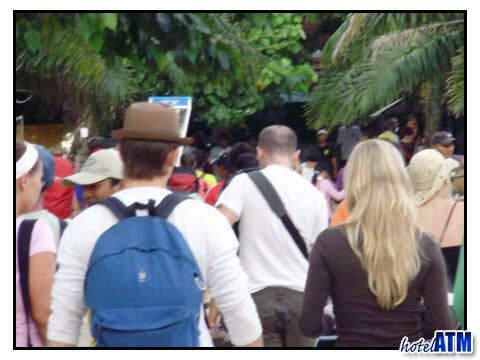 Not until customers arrived into Tonsai Bay from Phuket that tourist arrived with different styles and needs. Those needs were typically expressed in better standards of hostel and hotel and a better supply of western restaurants and coffee shops. Since then there has been a slow movement away from simple guesthouse accommodation towards more up market tourism. Having said that the prices are still right in low season so the island has many traveller, backpackers and students arriving on the island June till November. From 1998-2000 the island was taken by storm by a telecommunications and information technology revolution. Cable TV arrived and in October 1999 and the Phi Phi island made its first dramatic change. Interestingly the local population took to the English Premiership as there are active football tournaments and the love of the sport is strong. This was shortly followed by the Internet. The first server brought Internet connections. Finally, at about the same time of the arrival of Leonardo Di Caprio a GSM transmitter was connected on the island to hook up mobile phones. The effects of all this are still being played out. The fact that Leonardo Di Caprio was going to be filming in Maya Bay was of little interest to the local people because of the TV, Internet and phones. In January 2000 the stars and film crew arrived. According to the dive companies, a very small amount of coral was broken by the construction teams securing a pontoon to the entrance at Loh Samah Bay. They supplied the film crews in Maya Bay via a wooden walk way from Loh Samah and large ferries anchored off in the deep seas. Maya Bay was closed to all traffic. After the filming the controversy started. The National Parks wanted to keep the walk way their for the tourists. The walk way from Loh Samah to Maya bay was pulled down by local boatmen fearing that a permanent jetty would be the first step to the development of Maya Bay. More controversy appeared when the low season storm in June 2000 undermined undergrowth holding the sand beach in Maya Bay together. The media exaggerated the fault of the film crew. The plants properly replanted by the departing film company's marine experts were undercut by a combination of very high tides and a particularly bad low season storm. The plants seem to have taken properly now. When the film broke, dive operators were concerned that shark attacks were depicted in the story line. The local black tip reef shark are so timid you can go on special snorkeling shark watch tours. Local, captain and islander, Bang Gah said "they are beautiful predators but easily scared off". If you look at the number of divers per day (about 250/day) you understand that these are very safe waters. Before it was relatively easy to "Walk In" and get accommodation. Now many visitors research the net and book on line for hotels and tours. There are quiet times in plenty, especially in low season (May to November), when the Maya Bay was virtually cut off for 6 months. These months have great value with room rates being up to 50% cheaper than high season.